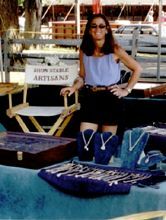 Over the years, SSA has showcased their jewelry in their booth at many horseshows- at the Winter Equestrian Festival in Wellington, Florida, at Old Salem Farm in New York, at Ox Ridge and The Fairfield Hunt Club Horseshows, at the Fidelity Classic Horseshow- and at many other horseshow venues throughout the Northeast. In our annual Equestrian Jewelry catalog, we also brought over 90,000 horse lovers 80 pages of spectacular equestrian jewelry- as well as offering great horse jewelry suitable for all ages and in all price ranges. Joining in with the World Wide On-Line Community! At this juncture, Show Stable Artisans is thrilled to be joining the “social networking” community. Our blog “In the Spotlight” will be focusing in on things that interest you, and bringing you the current fashion and jewelry trends. We will be introducing some special gift selections for the horse lover, we will have all of the latest and greatest offerings in equestrian jewelry couture, tips on wearing and caring for your jewelry, and gift suggestions for those picky horse loving teens. We will also discuss jewelry for “the woman who has everything”, suggest items for the “non-jewelry wearing” horseperson, we will talk to those folks who love their white metals, and for those who adore estate and antique horse jewelry, we will be showcasing our latest acquisitions! (We also have an extensive collection of estate pieces at www.equestrianjewelry.com – over 200 pieces!). But most importantly, we want to hear from you, and we want to know what you want to hear about! At www.equestrianjewelry.com , our catalog website, we have over 2,000 pieces of jewelry and gift items for the equestrian and horse lover. All of our items are proudly made in the USA by our master craftspeople. As well shopping our extensive inventory of items, we also hope that you will think of us as your personal shopper- we will be happy to work with you on a custom piece, recommend a particular piece, and help you decide on a special piece of jewelry for the horse lover in your life. Our 15 years at our jewelry booth, emailing with customers on line, and talking over the phone with thousands of shoppers has taught us how best we can help you! Please visit our website www.equestrianjewelry.com or call us anytime at 800-701-2710. The team at Show Stable Artisans also knows that giving back to the equestrian community is an important part of our role. To that end we donate a portion of every purchase to horse rescue organizations and therapeutic riding centers throughout the United States. We also have a special thoroughbred horse charm/pendant, and 30% of the price goes directly to The Mighty Thoroughbred Horse organization which supports thoroughbred retirement farms. In addition, we support the Breast Cancer Research Fund through our Ride for the Cure program. We have a super Ride for the Cure bracelet, charm, pendant and pin on our site to support that program. We hope we are assisting those in need in our small way.